There was a teacher who placed an old glove on his desk at the beginning of his Bible class for each semester. Periodically, he would talk to the glove and tell it do do something for him. “Turn off the lights”, he would say to the glove, or, “make me a cup of coffee”, or , “clean this desk off, it is dusty.” Of course the glove would not respond to his directions and would lay there lifeless as it was on his desk. 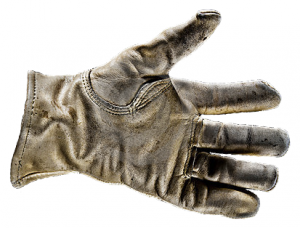 At the end of the semester, on the last day of class, without saying a word to preface his actions, the teacher would put on the old glove and perform the tasks that he had been asking the glove to do during the semester. Then he would leave his students with the following thought. “The glove by itself is useless”, he would say, “but with my hand in the glove and my arm directing it’s movements, it is now a useful tool.” The point the teacher made was obvious: we are the glove and we are not worth anything unless God’s presence fills us and His arm directs our thoughts and actions. As God empowers us and we depend on His strength, we are able to perform the tasks that He has given us to perform. The Hebrew word, “zakar” means, “to remember, to call to mind, make mention, recall past distress, remember sins, or remember the dealings of.” The word means more than just the mental act of recalling memories and is more about the actions that are taken because of remembering. For example, in Gen 8:1, “God remembered Noah and all the animals that were with him on the ark and He sent a wind over the earth and the waters receded.” God didn’t suddenly recall that there was a boat out there with Noah on it. By remembering them, He acted faithfully on the promise that He had made to Noah. Another biblical example of this is in Genesis 30:27, where the Text says that God remembered Rachel and she conceived. God wasn’t just thinking about Rachel; He acted on Rachel’s behalf because He remembered her in her distress. In contrast the Hebrew words for forget are, ”shakach” and “nashah” and they mean to ignore, neglect, forsake, or to act in disregard. Again, the words imply action – to act as if you have forgotten and to ignore, not just lose the memory of something. To forget in Hebrew is to act as if you don’t recall or treat as if you don’t remember. So how do these Hebrew words apply to us in our sinful state in the verses in Jeremiah and Hebrews quoted above? In turn, though, God expects us to do the same with those who have sinned against us. We are to forgive those who sin against us just as God does for us. Colossians 3:13 says, ”Forgive as the Lord forgave you.” We have to choose not to remember what people have done to us. It’ s not that we can just forget what has happened to us or lose the memory, but we have to act and treat it like it never happened, remembering it no more. Furthermore, the Text says this is the key to our sins being forgiven. Jesus taught us how to pray in the Lord’s Prayer in Matthew 6:9-13 and told us to say, “forgive us our debts, as we forgive our debtors.” Then, Jesus goes on to say in verse 14, ”For if you forgive men when they sin against you, your Heavenly Father will forgive you. But, if you do not forgive men their sins, your Father will not forgive your sins.” We have to choose not to “remember” just like God does. What a wonderful promise from Scripture that God will treat our sins “Like they never even happened!” Our challenge is to adopt that same slogan and pass that act of forgetfulness on to those who are in debt to us.